For other uses, see Conan the Barbarian (disambiguation). Conan the Barbarian (also known as Conan the Cimmerian) is a fictional sword and sorcery hero who originated in pulp fiction magazines and has since been adapted to books, comics, several films (including Conan the Barbarian and Conan the Destroyer), television programs (animated and live-action), video games, role-playing games, and other media. The character was created by writer Robert E. Howard in 1932 in a series of fantasy stories published in Weird Tales magazine. Conan the Barbarian was created by Robert E. Howard in a series of fantasy stories published in Weird Tales in 1932. For months, Howard had been in search of a new character to market to the burgeoning pulp outlets of the early 1930s. In October 1931, he submitted the short story "People of the Dark" to Clayton Publications' new magazine, Strange Tales of Mystery and Terror (June 1932). "People of the Dark" is a remembrance story of "past lives", and in its first-person narrative the protagonist describes one of his previous incarnations; Conan is a black-haired barbarian hero who swears by a deity called Crom. Some Howard scholars believe this Conan to be a forerunner of the more famous character. In February 1932, Howard vacationed at a border town on the lower Rio Grande. During this trip, he further conceived the character of Conan and also wrote the poem "Cimmeria", much of which echoes specific passages in Plutarch's Lives. According to some scholars, Howard's conception of Conan and the Hyborian Age may have originated in Thomas Bulfinch's The Outline of Mythology (1913) which inspired Howard to "coalesce into a coherent whole his literary aspirations and the strong physical, autobiographical elements underlying the creation of Conan". Having digested these prior influences after he returned from his trip, Howard rewrote a rejected story, "By This Axe I Rule!" (May 1929), replacing his existing character Kull of Atlantis with his new hero, and retitling it "The Phoenix on the Sword". Howard also wrote "The Frost-Giant's Daughter", inspired by the Greek myth of Daphne, and submitted both stories to Weird Tales magazine. Although "The Frost-Giant's Daughter" was rejected, the magazine accepted "The Phoenix on the Sword" after it received the requested polishing. "The Phoenix on the Sword" appeared in Weird Tales cover-dated December 1932. Editor Farnsworth Wright subsequently prompted Howard to write an 8,000-word essay for personal use detailing "the Hyborian Age", the fictional setting for Conan. Using this essay as his guideline, Howard began plotting "The Tower of the Elephant", a new Conan story that was the first to truly integrate his new conception of the Hyborian world. The publication and success of "The Tower of the Elephant" spurred Howard to write many more Conan stories for Weird Tales. By the time of Howard's suicide in 1936, he had written 21 complete stories, 17 of which had been published, as well as a number of unfinished fragments. Following Howard's death, the copyright of the Conan stories passed through several hands. Eventually, under the guidance of L. Sprague de Camp and Lin Carter, the stories were edited, revised, and sometimes rewritten. For roughly 40 years, the original versions of Howard's Conan stories remained out of print. In 1977, the publisher Berkley Books issued three volumes using the earliest published form of the texts from Weird Tales, but these failed to displace the edited versions. In the 1980s and 1990s, the copyright holders of the Conan franchise permitted Howard's stories to go out of print entirely, while continuing to sell Conan works by other authors. In 2000, the British publisher Gollancz Science Fiction issued a two-volume, complete edition of Howard's Conan stories as part of its Fantasy Masterworks imprint, which included several stories that had never seen print in their original form. 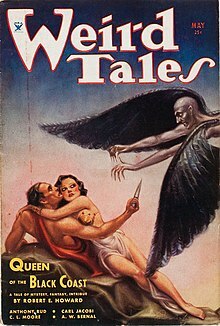 The Gollancz edition mostly used the versions of the stories as published in Weird Tales. The two volumes were combined and the stories resorted into chronological order as The Complete Chronicles of Conan: Centenary Edition (Gollancz Science Fiction, 2006; edited and with an Afterword by Steve Jones). In 2003, another British publisher, Wandering Star Books, made an effort both to restore Howard's original manuscripts and to provide a more scholarly and historical view of the Conan stories. It published hardcover editions in England, which were republished in the United States by the Del Rey imprint of Ballantine Books. The first book, Conan of Cimmeria: Volume One (1932–1933) (2003; published in the US as The Coming of Conan the Cimmerian) includes Howard's notes on his fictional setting, as well as letters and poems concerning the genesis of his ideas. This was followed by Conan of Cimmeria: Volume Two (1934) (2004; published in the US as The Bloody Crown of Conan) and Conan of Cimmeria: Volume Three (1935–1936) (2005; published in the US as The Conquering Sword of Conan). These three volumes combined include all of the original, unedited Conan stories. The various stories of Conan the Barbarian occur in the pseudo-historical "Hyborian Age", set after the destruction of Atlantis and before the rise of any known ancient civilization. This is a specific epoch in a fictional timeline created by Howard for many of the low fantasy tales of his artificial legendary. The reasons behind the invention of the Hyborian Age were perhaps commercial: Howard had an intense love for history and historical dramas; however, at the same time, he recognized the difficulties and the time-consuming research work needed in maintaining historical accuracy—and moreover, the poorly-stocked libraries in the rural part of Texas where Howard lived just didn't have the material needed for such historical research. By conceiving a timeless setting—"a vanished age"—and by carefully choosing names that resembled human history, Howard shrewdly avoided the problem of historical anachronisms and his need for lengthy exposition. According to "The Phoenix on the Sword", the adventures of Conan take place "Between the years when the oceans drank Atlantis and the gleaming cities, and the years of the rise of the Sons of Aryas." Conan is a Cimmerian. From the writings of Robert E. Howard (The Hyborian Age among others) it is known that his Cimmerians are based on the Celts or perhaps the historic Cimmerians, based on the described geography and the existence of said people. He was born on a battlefield and is the son of a village blacksmith. Conan matured quickly as a youth and, by age fifteen, he was already a respected warrior who had participated in the destruction of the Aquilonian fortress of Venarium. After its demise, he was struck by wanderlust and began the adventures chronicled by Howard, encountering skulking monsters, evil wizards, tavern wenches, and beautiful princesses. He roamed throughout the Hyborian Age nations as a thief, outlaw, mercenary, and pirate. As he grew older, he began commanding vast units of warriors and escalating his ambitions. In his forties, he seized the crown from the tyrannical king of Aquilonia, the most powerful kingdom of the Hyborian Age, having strangled the previous ruler on the steps of his own throne. Conan's adventures often result in him performing heroic feats, though his motivation for doing so is largely to protect his own survival or for personal gain. A conspicuous element of Conan's character is his chivalry. He is extremely reluctant to fight women (even when they fight him) and has a strong tendency to save damsels in distress. In "Jewels of Gwahlur", he has to make a split-second decision whether to save the dancing girl Muriela or the chest of priceless gems which he spent months in search of. So, without hesitation, he rescues Muriela and allows for the treasure to be irrevocably lost. In "The Black Stranger", Conan saves the exile Zingaran Lady Belesa at considerable risk to himself, giving her as a parting gift his fortune in gems big enough to have a comfortable and wealthy life in Zingara, while asking for no sexual favors in return. Reviewer Jennifer Bard also noted that when Conan is in a pirate crew or a robber gang led by another male, his tendency is to subvert and undermine the leader's authority, and eventually supplant (and often, kill) him (e.g. "Pool of the Black One", "A Witch Shall be Born", "Shadows in the Moonlight"). Conversely, in "Queen of the Black Coast", it is noted that Conan "generally agreed to Belit's plan. Hers was the mind that directed their raids, his the arm that carried out her ideas. It was a good life." And at the end of "Red Nails", Conan and Valeria seem to be headed towards a reasonably amicable piratical partnership. George Baxter noted that "Conan's recorded history mentions him as being prominently involved, at one time or another, with four different pirate fraternities, on two different seas, as well being a noted leader of land robbers at three different locales. Yet, we hardly ever see him involved in, well, robbing people. To be sure, he speaks about it often and with complete candor: "We Kozaks took to plundering the outlying dominions of Koth, Zamora, and Turan impartially" he says in "Shadows in the Moonlight". But that was before the story began. And "We're bound for waters where the seaports are fat, and the merchant ships are crammed with plunder!" Conan declares at the end of "The Pool of the Black One". But this plundering will take place after the story ends. When we see Conan onstage, we see him do many other things: he intervenes in the politics and dynastic struggles of various kingdoms; he hunts for hidden treasure; he explores desert islands and lost cities; he fights countless terrible monsters and evil sorcerers; he saves countless beautiful women and makes them fall in love with him... What we virtually never see Conan do is engage in the proper business of an armed robber, on land or by sea—which is to attack people who never threatened or provoked you, take away their possessions by main force, and run your sword through them if they dare to resist. A bit messy business, that. Armchair adventurers, who like to enjoy a good yarn in the perfect safety and comfort of their suburban homes, might not have liked to read it." Robert E. Howard, The Phoenix on the Sword, 1932. Conan has "sullen", "smoldering", and "volcanic" blue eyes with a black "square-cut mane". Howard once describes him as having a hairy chest and, while comic book interpretations often portray Conan as wearing a loincloth or other minimalist clothing to give him a more barbaric image, Howard describes the character as wearing whatever garb is typical for the kingdom and culture in which Conan finds himself. Howard never gave a strict height or weight for Conan in a story, only describing him in loose terms like "giant" and "massive". In the tales, no human is ever described as being stronger than Conan, although several are mentioned as taller (such as the strangler Baal-pteor) or of larger bulk. In a letter to P. Schuyler Miller and John D. Clark in 1936, only three months before Howard's death, Conan is described as standing 6 feet (180 cm) and weighing 180 pounds (82 kg) when he takes part in an attack on Venarium at only 14 years old, though being far from fully grown. Conan himself says in "Beyond the Black River" that he had "...not yet seen 15 snows". Although Conan is muscular, Howard frequently compares his agility and way of moving to that of a panther (see, for instance, "Jewels of Gwahlur", "Beyond the Black River", or "Rogues in the House"). His skin is frequently characterized as bronzed from constant exposure to the sun. In his younger years, he is often depicted wearing a light chain shirt and a horned helmet, though appearances vary with different stories. ... a tall man, mightily shouldered and deep of chest, with a massive corded neck and heavily muscled limbs. He was clad in silk and velvet, with the royal lions of Aquilonia worked in gold upon his rich jupon, and the crown of Aquilonia shone on his square-cut black mane; but the great sword at his side seemed more natural to him than the regal accoutrements. His brow was low and broad, his eyes a volcanic blue that smoldered as if with some inner fire. His dark, scarred, almost sinister face was that of a fighting-man, and his velvet garments could not conceal the hard, dangerous lines of his limbs. 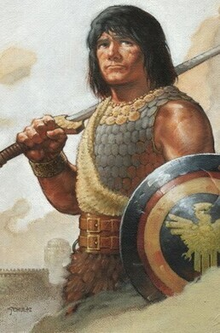 Howard imagined the Cimmerians as a pre-Celtic people with mostly black hair and blue or grey eyes. Ethnically, the Cimmerians to which Conan belongs are descendants of the Atlanteans, though they don't remember their ancestry. In his fictional historical essay "The Hyborian Age", Howard describes how the people of Atlantis—the land where his character King Kull originated—had to move east after a great cataclysm changed the face of the world and sank their island, settling where Ireland and Scotland would eventually be located. Thus they are (in Howard's work) the ancestors of the Irish and Scottish (the Celtic Gaels) and not the Picts, the other ancestor of modern Scots who also appear in Howard's work. In the same work, Howard also described how the Cimmerians eventually moved south and east after the age of Conan (presumably in the vicinity of the Black Sea, where the historical Cimmerians dwelt). Despite his brutish appearance, Conan uses his brains as well as his brawn. The Cimmerian is a highly skilled warrior, possibly without peer with a sword, but his travels have given him vast experience in other trades, especially as a thief. He's also a talented commander, tactician, and strategist, as well as a born leader. In addition, Conan has advanced knowledge of languages and codes and is able to recognize, or even decipher, certain ancient or secret signs and writings. For example, in "Jewels of Gwahlur" Howard states: "In his roaming about the world the giant adventurer had picked up a wide smattering of knowledge, particularly including the speaking and reading of many alien tongues. Many a sheltered scholar would have been astonished at the Cimmerian's linguistic abilities." He also has incredible stamina, enabling him to go without sleep for a few days. In "A Witch Shall be Born", Conan fights armed men until he is overwhelmed, captured, and crucified, before going an entire night and day without water. However, Conan still possesses the strength to pull the nails from his feet, while hoisting himself into a horse's saddle and riding for ten miles. Another noticeable trait is his sense of humor, largely absent in the comics and movies, but very much a part of Howard's original vision of the character (particularly apparent in "Xuthal of the Dusk", also known as "The Slithering Shadow.") His sense of humor can also be rather grimly ironic, as was demonstrated by how he unleashes his own version of justice on the treacherous—and ill-fated—innkeeper Aram Baksh in "Shadows in Zamboula". He is a loyal friend to those true to him, with a barbaric code of conduct that often marks him as more honorable than the more sophisticated people he meets in his travels. Indeed, his straightforward nature and barbarism are constants in all the tales. Conan is a formidable combatant both armed and unarmed. With his back to the wall, Conan is capable of engaging and killing opponents by the score. This is seen in several stories, such as "Queen of the Black Coast", "The Scarlet Citadel", and "A Witch Shall Be Born". Conan is not superhuman, though; he needed the providential help of Zelata's wolf to defeat four Nemedian soldiers in Howard's novel The Hour of the Dragon. Some of his hardest victories have come from fighting single opponents of inhuman strength: one such as Thak, an ape-like humanoid from "Rogues in the House", or the strangler Baal-Pteor in "Shadows in Zamboula". Conan is far from untouchable and has been captured or defeated several times (on one occasion, knocking himself out drunkenly after running into a wall). Howard frequently corresponded with H. P. Lovecraft, and the two would sometimes insert references or elements of each other's settings in their works. Later editors reworked many of the original Conan stories by Howard, thus diluting this connection. Nevertheless, many of Howard's unedited Conan stories are arguably part of the Cthulhu Mythos. Additionally, many of the Conan stories by Howard, de Camp, and Carter used geographical place names from Clark Ashton Smith's Hyperborean Cycle. Cover of Weird Tales (May 1934) depicting Conan and Bêlit in Queen of the Black Coast, one of Robert E. Howard's original Conan stories. "Gods of the North" (March 1934) – published as The Frost-Giant's Daughter in The Coming of Conan, 1953. "The God in the Bowl" – Published in Space Science Fiction, Sep. 1952. "The Black Stranger" – Published in Fantasy Magazine, Feb. 1953. "The Vale of Lost Women" – Published in The Magazine of Horror, Spring 1967. "Drums of Tombalku" – Fragment. Published in Conan the Adventurer, 1966. "The Hall of the Dead" – Synopsis. Published in The Magazine of Fantasy and Science Fiction, February 1967. "The Hand of Nergal" – Fragment. Published in Conan, 1967. "The Snout in the Dark" – Fragment. Published in Conan of Cimmeria, 1969. A number of untitled synopses for Conan stories also exist. "The Hyborian Age" – An essay written in 1932. Published in 1938 in The Hyborian Age. "Cimmeria" – A poem written in 1932. Published in 1965 in The Howard Collector. The character of Conan has proven durably popular, resulting in Conan stories by later writers such as Poul Anderson, Leonard Carpenter, Lin Carter, L. Sprague de Camp, Roland J. Green, John C. Hocking, Robert Jordan, Sean A. Moore, Björn Nyberg, Andrew J. Offutt, Steve Perry, John Maddox Roberts, Harry Turtledove, and Karl Edward Wagner. Some of these writers have finished incomplete Conan manuscripts by Howard. Others were created by rewriting Howard stories which originally featured entirely different characters from entirely different milieus. Most, however, are completely original works. In total, more than fifty novels and dozens of short stories featuring the Conan character have been written by authors other than Howard. The Gnome Press edition (1950–1957) was the first hardcover collection of Howard's Conan stories, including all the original Howard material known to exist at the time, some left unpublished in his lifetime. The later volumes contain some stories rewritten by L. Sprague de Camp (like "The Treasure of Tranicos"), including several non-Conan Howard stories, mostly historical exotica situated in the Levant at the time of the Crusades, which he turned into Conan yarns. The Gnome edition also issued the first Conan story written by an author other than Howard—the final volume published, which is by Björn Nyberg and revised by de Camp. The Lancer/Ace editions (1966–1977), under the direction of de Camp and Lin Carter, were the first comprehensive paperbacks, compiling the material from the Gnome Press series together in chronological order with all the remaining original Howard material, including that left unpublished in his lifetime and fragments and outlines. These were completed by de Camp and Carter. The series also included Howard stories originally featuring other protagonists that were rewritten by de Camp as Conan stories. New Conan stories written entirely by de Camp and Carter were added as well. Lancer Books went out of business before bringing out the entire series, the publication of which was completed by Ace Books. Eight of the eventual twelve volumes published featured dynamic cover paintings by Frank Frazetta that, for many fans,[who?] presented the definitive, iconic impression of Conan and his world. For decades to come, most other portrayals of the Cimmerian and his imitators were heavily influenced by the cover paintings of this series. Most editions after the Lancer/Ace series have been of either the original Howard stories or Conan material by others, but not both. The exception are the Ace Maroto editions (1978–1981), which include both new material by other authors and older material by Howard, though the latter are some of the non-Conan tales rewritten as Conan stories by de Camp. Notable later editions of the original Howard Conan stories include the Donald M. Grant editions (1974–1989, incomplete); Berkley editions (1977); Gollancz editions (2000–2006), and Wandering Star/Del Rey editions (2003–2005). Later series of new Conan material include the Bantam editions (1978–1982) and Tor editions (1982–2004). In an attempt to provide a coherent timeline which fit the numerous adventures of Conan penned by Robert E. Howard and later writers, various "Conan chronologies" have been prepared by many people from the 1930s onward. Note that no consistent timeline has yet accommodated every single Conan story. The following are the principal theories that have been advanced over the years. Miller/Clark chronology – A Probable Outline of Conan's Career (1936) was the first effort to put the tales in chronological order. Completed by P. Schuyler Miller and John Drury Clark, the chronology was later revised by Clark and L. Sprague de Camp in An Informal Biography of Conan the Cimmerian (1952). Robert Jordan chronology – A Conan Chronology by Robert Jordan (1987) was a new chronology written by Conan writer Robert Jordan that included all written Conan material up to that point. It was heavily influenced by the Miller/Clark/de Camp chronologies, though it departed from them in a number of idiosyncratic instances. William Galen Gray chronology – Timeline of Conan's Journeys (1997, rev. 2004), was fan William Galen Gray's attempt to create "a chronology of all the stories, both Howard and pastiche." Drawing on the earlier Miller/Clark and Jordan chronologies, it represents the ultimate expression of their tradition to date. Joe Marek chronology – Joe Marek's chronology is limited to stories written (or devised) by Howard, though within that context it is essentially a revision of the Miller/Clark tradition to better reflect the internal evidence of the stories and avoid forcing Conan into what he perceives as a "mad dash" around the Hyborian world within timeframes too rapid to be credible. Dale Rippke chronology – The Darkstorm Conan Chronology (2003) was a completely revised and heavily researched chronology, radically repositioning a number of stories and including only those stories written or devised by Howard. The Dark Horse comic series follows this chronology. The very first Conan cinematic project was planned by Edward Summer. Summer envisioned a series of Conan films, much like the James Bond franchise. He outlined six stories for this film series, but none were ever made. An original screenplay by Summer and Roy Thomas was written, but their lore-authentic screen story was never filmed. However, the resulting film, Conan the Barbarian (1982), was a combination of director John Milius' ideas and plots from Conan stories (written also by Howard's successors, notably Lin Carter and L. Sprague de Camp). The addition of Nietzschean motto and Conan's life philosophy were crucial for bringing the spirit of Howard's literature to the screen. The plot of Conan the Barbarian (1982) begins with Conan being enslaved by the Vanir raiders of Thulsa Doom, a malevolent warlord who is responsible for the slaying of Conan's parents and the genocide of his people. Later, Thulsa Doom becomes a cult leader of a religion that worships Set, a Snake God. The vengeful Conan, the archer Subotai and the thief Valeria set out on a quest to rescue a princess held captive by Thulsa Doom. The film was directed by John Milius and produced by Dino De Laurentiis. The character of Conan was played by Arnold Schwarzenegger and was his break-through role as an actor. This film was followed by a less popular sequel, Conan the Destroyer in 1984. This sequel was a more typical fantasy-genre film and was even less faithful to Howard's Conan stories, being just a picaresque story of an assorted bunch of adventurers. The third film in the Conan trilogy was planned for 1987 to be titled Conan the Conqueror. The director was to be either Guy Hamilton or John Guillermin. Since Arnold Schwarzenegger was committed to the film Predator and De Laurentiis's contract with the star had expired after his obligation to Red Sonja and Raw Deal, he wasn't keen to negotiate a new one; thus the third Conan film sank into development hell. The script was eventually turned into Kull the Conqueror. There were rumors in the late 1990s of another Conan sequel, a story about an older Conan titled King Conan: Crown of Iron, but Schwarzenegger's election in 2003 as governor of California ended this project. Warner Bros. spent seven years trying to get the project off the ground. However, in June 2007 the rights reverted to Paradox Entertainment, though all drafts made under Warner remained with them. In August 2007, it was announced that Millennium Films had acquired the rights to the project. Production was aimed for a Spring 2006 start, with the intention of having stories more faithful to the Robert E. Howard creation. In June 2009, Millennium hired Marcus Nispel to direct. In January 2010, Jason Momoa was selected for the role of Conan. The film was released in August 2011, and met poor critical reviews and box office results. In 2012, producers Chris Morgan and Frederick Malmberg announced plans for a sequel to the 1982 Conan the Barbarian titled The Legend of Conan, with Arnold Schwarzenegger reprising his role as Conan. A year later, Deadline reported that Andrea Berloff would write the script. Years passed since the initial announcement as Schwarzenegger worked on other films, but as late as 2016, Schwarzenegger affirmed his enthusiasm for making the film, saying, "Interest is high ... but we are not rushing." The script was finished, and Schwarzenegger and Morgan were meeting with possible directors. In April 2017, producer Chris Morgan stated that Universal had dropped the project, although there was a possibility of a TV show. The story of the film was supposed to be set 30 years after the first, with some inspiration from Clint Eastwood's Unforgiven. Conan the Adventurer is an animated television series produced by Jetlag Productions and Sunbow Productions that debuted on October 1, 1992, ran for 64 episodes and concluded exactly two years later, on October 1, 1994. The series involved Conan chasing Serpent Men across the world in an attempt to release his parents from eternal imprisonment as living statues. Conan and the Young Warriors is an animated television series that premiered in 1994 and ran for 13 episodes. DiC Entertainment produced the show and CBS aired this series as a spin-off to the previous animated series. This cartoon took place after the finale of Conan the Adventurer with Wrath-Amon vanquished and Conan's family returned to life from living stone. Conan soon finds that the family of one of his friends are being turned into wolves by an evil sorceress and he must train three warriors in order to aid him in rescuing them. Conan the Adventurer is a live-action television series that premiered on September 22, 1997, and ran for 22 episodes. It starred German bodybuilder Ralf Möller as Conan and Danny Woodburn as his sidekick Otli. The storyline was quite different from the Conan lore of Howard. In this adaptation, Conan is a pleasant and jovial person. Also in this version, Conan is not a loner but one member of a merry band of adventurers. In February 2018, Deadline reported that a new Conan TV series was in the works at Amazon Prime with Ryan Condal, Miguel Sapochnik, Warren Littlefield, Pathfinder Media and Endeavor Content working on the project. Conan the Barbarian has appeared in comics nearly non-stop since 1970. The comics are arguably, apart from the books, the vehicle that had the greatest influence on the longevity and popularity of the character. Aside from an earlier and unofficial Conan comic published in Mexico, the two main publishers of Conan comics have been Marvel Comics and Dark Horse Comics. Marvel Comics launched Conan the Barbarian (1970–1993) and the classic Savage Sword of Conan (1974–1995). Dark Horse launched their Conan series in 2003. Dark Horse Comics is currently publishing compilations of the 1970s Marvel Comics series in trade paperback format. Barack Obama, former President of the United States, is a collector of Conan the Barbarian comic books and a big fan of the character and appeared as a character in a comic book called Barack the Barbarian from Devil's Due. Marvel Comics introduced a relatively lore-faithful version of Conan the Barbarian in 1970 with Conan the Barbarian, written by Roy Thomas and illustrated by Barry Windsor-Smith. Smith was succeeded by penciller John Buscema, while Thomas continued to write for many years. Later writers included J.M. DeMatteis, Bruce Jones, Michael Fleisher, Doug Moench, Jim Owsley, Alan Zelenetz, Chuck Dixon and Don Kraar. In 1974, Conan the Barbarian series spawned the more adult-oriented, black-and-white comics magazine Savage Sword of Conan, written by Thomas with art mostly by Buscema or Alfredo Alcala. Marvel also published several graphic novels starring the character, and a handbook with detailed information about the Hyborian world. The Marvel Conan stories were also adapted as a newspaper comic strip which appeared daily and Sunday from 4 September 1978 to 12 April 1981. Originally written by Roy Thomas and illustrated by John Buscema, the strip was continued by several different Marvel artists and writers. Dark Horse Comics began their comic adaptation of the Conan saga in 2003. Entitled simply Conan, the series was first written by Kurt Busiek and pencilled by Cary Nord. Tim Truman replaced Busiek when Busiek signed an exclusive contract with DC Comics; however, Busiek issues were sometimes used for filler. This series is an interpretation of the original Conan material by Robert E. Howard with no connection whatsoever to the earlier Marvel comics or any Conan story not written or envisioned by Howard supplemented by wholly original material. A second series, Conan the Cimmerian was released in 2008 by Tim Truman (writer) and Tomás Giorello (artist). The series ran for twenty-six issues, including an introductory "zero" issue. Dark Horse's third series, Conan: Road of Kings, began in December 2010 by Roy Thomas (writer) and Mike Hawthorne (artist) and ran for twelve issues. A fourth series, Conan the Barbarian, began in February 2012 by Brian Wood (writer) and Becky Cloonan (artist). It ran for twenty-five issues, and expanded on Robert E. Howard's Queen of the Black Coast. A fifth series, Conan the Avenger, began in April 2014 by Fred Van Lente (writer) and Brian Ching (artist). It ran for twenty-five issues, and expanded on Robert E. Howard's The Snout in the Dark and A Witch Shall Be Born. Dark Horse's sixth series, Conan the Slayer, began in July 2016 by Cullen Bunn (writer) and Sergio Dávila (artist). In 2018, Marvel reacquired the rights and started new runs of both Conan the Barbarian and Savage Sword of Conan in January/February 2019. Seven video games have been released based on the Conan mythos. In 1984, Datasoft released Conan: Hall of Volta for the Apple II, Atari 800, and the Commodore 64. In 1991, Mindscape released Conan: The Mysteries of Time for NES, a Commodore 64 port by System 3. In 1991, Virgin Games and Synergistic released Conan: The Cimmerian for Amiga and DOS. In 2004, TDK Mediactive released Conan, a third-person action game for Windows and consoles. In 2007, THQ and Nihilistic released Conan, a third-person action game for PlayStation 3 and Xbox 360. In 2008, Funcom released Age of Conan, a MMORPG, on May 20 in the US and May 23 in Europe. A RPG game titled "Conan: The Tower of the Elephant" was released for the iOS around the time of the release of the movie Conan the Barbarian as a promotion. The game is based on the short story of the same name. On January 31, 2017, Funcom released Conan Exiles for PS4, Xbox One and PC. The title is an open world survival game. The game was released in early access, and was released on May 8, 2018. In 2019, Funcom is to release a real time strategy game named Conan Unconquered. In 2006, Comic Images released the Conan Collectible Card Game designed by Jason Robinette. In 2009, Fantasy Flight Games released the Age of Conan strategy board game, depicting warfare between the Hyborian nations in the Conan's adventures. In 2016, Monolith Board Games LLC will release a new boardgame with miniatures directly based on Howard's short stories. Conan (previously known as Conan: Hyborian Quests) pits one player, controlling the evil forces, against 2-4 other players controlling Conan and his companions. Conan: The Roleplaying Game (2004), with many supplements. Conan: Adventures in an Age Undreamed Of (hardcover, 368 pages, 2017), with two hardcover supplements already published and at least 17 additional supplements in the works (as planned following the Kickstarter). Hyborian War, introduced by Reality Simulations, Inc. as of 1985, is a play-by-mail game set in the Hyborian Age. Bêlit – A self-styled queen of the Black Coast, captain of the pirate ship Tigress, and Conan's first serious lover (Queen of the Black Coast). Thoth-Amon – A Stygian wizard of great power who appeared in the first Conan story written (The Phoenix on the Sword) and was mentioned in The God in the Bowl and The Hour of the Dragon. L. Sprague de Camp and Lin Carter made Thoth-Amon the nemesis of Conan. In the Marvel comics, Thoth-Amon was also Conan's lifelong opponent and had a striking appearance designed by Barry Windsor-Smith; he wore a distinctive ram-horn ornamental headdress. He is portrayed by Pat Roach in Conan the Destroyer. Valeria – A female mercenary affiliated with the Red Brotherhood (Red Nails). Yara – An evil wizard and adversary of Conan (The Tower of the Elephant) who enslaved Yag-Kosha, an extraterrestrial being resembling Hindu god Ganesh. Zenobia – A seraglio concubine whom Conan promises to wed and make queen of Aquilonia (The Hour of the Dragon). Red Sonja – An Hyrkanian warrior created by Roy Thomas and Barry Windsor-Smith for the Conan comics. She was based on the Howard character, Red Sonya of Rogatino, who appeared in The Shadow of the Vulture. A novella set in the 16th century. Jenna – (Marvel comics character). A dancing girl from the city of Shadizar. She becomes Conan's girlfriend after he saves her from a monstrous bat, but later betrays him to the authorities. Conan gets his revenge by throwing her into a pool of sewage. Based on an unnamed character in the prose story Rogues in the House. Fafnir – A mighty red-bearded Vanir warrior and pirate captain. At first he and Conan are enemies, but they soon become allies after being shipwrecked. Thulsa Doom – A skull-faced necromancer from a King Kull story, a recurring villain in the Kull comics, and the antagonist in the 1982 film, played by James Earl Jones. Rexor – In the 1982 movie, the chief priest of Thulsa Doom's snake cult, who stole the sword of Conan's father. Played by Ben Davidson. Subotai – Hyrkanian thief and archer. He is Conan's companion in the 1982 film. Played by Gerry Lopez. Akiro – A character from the two Schwarzenegger Conan movies. He's a powerful wizard who befriends Conan and Subotai. He is played by Japanese actor Mako Iwamatsu. ^ Herron (1984). p. 149: "Robert E. Howard of Cross Plains, Texas, created one of the great mythic figures in modern popular culture, the Dark Barbarian... [which] put Howard in the select ranks of the literary legend-makers"
^ "Conan the Barbarian - Superhero Wiki Encyclopedia". superherouniverse.com. Retrieved 2017-10-31. ^ Howard, Robert E. (6 December 1932). "The Phoenix on the Sword". Weird Tales (20). ^ Conan the Warrior (1935): "Beyond the Black River"
^ Dr. Jennifer Agatha Bard, "Gender Roles in Science Fiction and Fantasy", Bulletin of Gender Equality, Summer 1986. ^ Howard, Robert E. "A Witch Shall Be Born": "the man was almost a giant in stature"; "Knots and bunches of muscle started out of the massive arms". ^ Collis, Clark. "Empire Essay: The Terminator". Empire magazine. Archived from the original on 2007-09-27. Retrieved 2007-04-22. ^ Brian Linder (October 8, 2003). "Goodbye Hollywood, Hello Sacramento". IGN.com. IGN Entertainment, Inc. Retrieved March 7, 2010. ^ Fleming, Michael (August 12, 2007). "Millennium wins rights to 'Conan'". Variety. Reed Elsevier Inc. Archived from the original on June 5, 2011. Retrieved March 9, 2010. ^ Fleming, Michael (June 11, 2009). "Marcus Nispel to direct 'Conan' remake". Variety. Reed Elsevier Inc. Archived from the original on June 29, 2011. ^ David McNary (January 21, 2010). "Momoa set for 'Conan'". Variety. Reed Elsevier Inc. Retrieved March 9, 2010. ^ Child, Ben (2012-10-26). "Arnold Schwarzenegger to reprise his role as Conan the Barbarian." TheGuardian.com. Retrieved 2016-02-04. ^ Fleming, Mike (2012-10-25). "Schwarzenegger And Conan The Barbarian Reunited in Universal Reboot". Deadline.com. Retrieved 2012-11-17. ^ Cornet, Roth (2014-01-29). "The Legend of Conan Producer Chris Morgan Says Arnold Schwarzenegger's Return to the Role is Going to be Their Unforgiven." IGN.com. Retrieved 2014-02-11. ^ Fleming, Mike, Jr. (2013-10-01). " 'Legend of Conan' Lands Adrea Berloff To Script Arnold Schwarzenegger Epic Reprise." Deadline.com. Retrieved 2014-02-11. ^ a b Schaefer, Sandy (2016-01-25). "Arnold Schwarzenegger Offers Legend of Conan Title & Director Update." ScreenRant.com. Retrieved 2016-01-27. ^ a b Auty, Dan (2016-01-26). "Arnold Schwarzenegger on His Plans for New Conan Movie." GameSpot.com. Retrieved 2016-01-27. ^ "Arnold Schwarzenegger's 'The Legend of Conan' May Not Happen After All". /Film. 6 April 2017. Retrieved 7 April 2017. ^ Andreeva, Nellie (February 5, 2018). "Conan the Barbarian TV Series In Works At Amazon From Ryan Condal, Miguel Sapochnik & Warren Littlefield". Deadline Hollywood. Retrieved February 5, 2018. ^ "Conan (comic book character)". Comicvine.com. Retrieved 2012-11-17. ^ Swaine, Jon (7 November 2008). "Barack Obama: The 50 facts you might not know". The Daily Telegraph. London. Retrieved 11 November 2008. ^ Mail Foreign Service (7 April 2009). "Meet Barack the Barbarian taking on scantily clad nemesis Sarah Palin in new comic superhero role". Daily Mail. London. Retrieved 7 August 2009. ^ Spillius, Alex (7 April 2009). "Barack Obama and Sarah Palin appear in comic series". The Daily Telegraph. London. Retrieved 26 November 2009. ^ Flood, Alison (8 April 2009). "Obama battles Red Sarah in comic clash". The Guardian. London. Retrieved 26 November 2009. ^ "Conan Exiles". Conan Exiles. ^ "Conan Unconquered on Steam". store.steampowered.com. ^ "Robert E. Howard's Conan: Adventures In An Age Undreamed Of". Mophidius Entertainment. February 9, 2015. Retrieved February 9, 2015. Blosser, Fred (1997). "The Star Rover and "The People of the Night"". The Dark Man #4: 16–18. Thomas, Roy (2006). Conan: The Ultimate guide to the world's most savage babarian. DK Publishing. ISBN 978-0-7566-2095-0. Zelenetz, Alan (1986). The Official Handbook of the Conan Universe. Marvel Comics. This page was last edited on 7 April 2019, at 07:02 (UTC).